Malaria is a disease of the blood that can be fatal. It is caused by the eukaryotic protists Plasmodium spp. The protists are spread to humans most commonly through mosquitoes of the genus anopheles , in tropical areas of Asia, Africa and North and South America. Less than one percent of those infected die from the disease, but more serious cases caused by P. falciparum are more lethal. In addition to the acute effects of malaria, the International Agency for Research on Cancer has evaluated P. falciparum as probably carcinogenic to humans (Group 2A) in regions where it is endemic. The evaluation is partly based upon strong evidence that P. falciparum reactivates Epstein–Barr virus, which is known to cause Burkitt lymphoma in humans. Malaria has, globally, more impact on economics and public health than almost any other infectious disease. The considerable effort invested by many organizations into developing a malaria vaccine, which would radically alter the health situations in affected countries while generating very little profit, is a convenient and effective foil to conspiracy theories surrounding Big Pharma. The distribution of malaria in the Old World before malaria-eradication efforts. 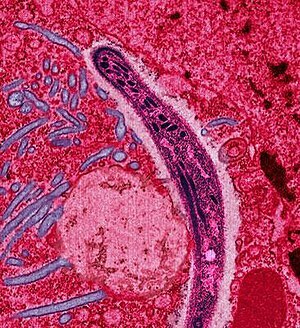 Malaria has revealed numerous mutations in humans, that normally would have been either neutral or deleterious, but have become beneficial in areas where malaria is prevalent. Due to their benefits for populations in high-risk areas of malaria, these mutations have thrived. The distribution of sickle-cell disease in pre-modern times. A single-point mutation in the gene that codes for hemoglobin-β causes a severe disease in humans called sickle-cell disease. The point mutation causes a single shift of amino acids, from the hydrophobic glutamate to hydrophilic valine, and creates a drastic shift in fold of the protein. Sickle-cell disease is lethal to those homozygous for the allele, while those heterozygous for sickle-cell have fewer issues that arise due to the disease. The allele causes a deformity in the red blood cells that greatly reduces malaria infections in those individuals. Thalassemias are a set of related inherited diseases that cause imbalance in the synthesis of the two polypeptide chains of hemoglobin. Similar to sickle-cell disease, thalassemia was usually fatal for those inheriting the homozygous allele ("thalassemia major"), but those with the heterozygous allele ("thalassemia minor") were usually protected from malaria. Today, those with β-thalassemia major can be treated with banked umbilical cord blood for their entire life. Glucose-6-phosphate dehydrogenase is an enzyme which aids in the natural antioxidant protection of red blood cells. A mutation in the gene which codes for the protein G6PD causes hemolytic anemia, where red blood cells are more rapidly broken down and excreted from the body, thus new red blood cells must be produced quicker. This cycle causes an intolerable environment for malaria to develop, and thus reduces the infection rate for the disease. The widespread use of chloroquine for decades against malaria, both as treatment and prophylaxis, has resulted in the evolution of strains of P. falciparum with novel mechanisms for preventing the drug from poisoning them. In certain countries these strains have become the common form of falciparum, and since falciparum is among the more lethal plasmodium parasites, it has become necessary in places to transition to other antimalarial drugs, usually derivatives of artemisinin and other derivatives of quinine. Newer antimalarial formulations (generally those sold in the developing world to travelers) frequently combine multiple drugs (e.g. Malarone, a preparation of atovaquone and proguanil) in order to delay the evolution of resistance, much as GM corn varieties are being introduced which produce multiple natural insecticides to make resistance to any one of them less likely. Given Malaria's highly detrimental effect on humanity, there have been efforts to eradicate it as soon as people found out how it works. For a long time the most efficient means was avoiding contact with mosquitoes, but once DDT was developed the mosquitoes themselves could be targeted. Aggressive efforts in the US and Europe quickly got rid of a disease whose name comes from medieval Italian and whose prevalence in the US South has been cited as one of the reasons for the use of African instead of Native American slaves. Unfortunately, corruption, stopping too early and several other factors have caused those efforts to be much less successful in most of the global south and some countries even had a resurgence of malaria after it was believed to be eradicated. By the 1970s the WHO had decided to change strategy and now eradication was not the official end-goal any more. Since then several private and public institutions (including the Bill and Melinda Gates Foundation) have invested millions of dollars into preventive measures as well as the search for better cures and vaccines. Even the poorest countries have aggressive programs to combat stagnant water (the breeding grounds for mosquitoes) and fumigate dwellings if an outbreak occurs. Still, a lot of wealth is lost and gigantic human suffering is caused by the premature deaths and the people who are afflicted by the disease in the prime of their youth. ↑ See the Wikipedia article on Multidrug therapy.